In 1500, a year before the construction of the new Richmond Palace began, the name of the town of Sheen, which had grown up around the royal manor, was changed to "Richmond" by command of Henry VII. However, both names, Sheen and Richmond, continue to be used, not without scope for confusion. Curiously, today's districts of East Sheen and North Sheen, now under the administrative control of the London Borough of Richmond upon Thames, were never in ancient times within the manor of Sheen, but were rather developed during the 19th and 20th centuries in parts of the adjoining manor and parish of Mortlake. Richmond remained part of the County of Surrey until the mid-1960s, when it was absorbed by the expansion of Greater London. Richmond Palace was a favourite home of Queen Elizabeth, who died there in 1603. It remained a residence of the kings and queens of England until the death of Charles I in 1649. Within months of his execution, the Palace was surveyed by order of Parliament and was sold for £13,000. Over the following ten years it was largely demolished, the stones and timbers being re-used as building materials elsewhere. Only vestigial traces now survive, notably the Gate House. (51°27'40.52"N 0°18'32.53"W). The site of the former palace is the area between Richmond Green and the River Thames, and some local street names provide clues to existence of the former Palace, including Old Palace Lane and Old Palace Yard. Henry I divided the manor of Shene from the royal manor of Kingston and granted it to a Norman knight. The manor-house of Sheen was established by at least 1125. In 1299 Edward I took his whole court to the manor-house at Sheen, close by the river side. In 1305, he received at Sheen the Commissioners from Scotland to arrange the Scottish civil government. It returned to royal hands in the reign of Edward II and after his deposition it was held by his wife, Queen Isabella. When the boy-king Edward III came to the throne in 1327 he gave the manor to his mother Isabella. After her death he extended and embellished the manor house and turned it into the first Shene Palace. Edward III died at Shene on 21 June 1377. In 1368 Geoffrey Chaucer served as a yeoman at Sheen. Richard II was the first English king to make Sheen his main residence in 1383. He took his bride Anne of Bohemia there. Twelve years later Richard was so distraught at the death of Anne at the age of 28, that he, according to Holinshed, "caused it [the manor] to be thrown down and defaced; whereas the former kings of this land, being wearied of the citie, used customarily thither to resort as to a place of pleasure, and serving highly to their recreation." For almost 20 years it lay in ruins until Henry V undertook rebuilding work in 1414. The first, pre-Tudor, version of the palace was known as Sheen Palace. It was positioned roughly at 51°27′37″N 0°18′37″W﻿ / ﻿51.460388°N 0.310219°W﻿ / 51.460388; -0.310219Coordinates: 51°27′37″N 0°18′37″W﻿ / ﻿51.460388°N 0.310219°W﻿ / 51.460388; -0.310219, in what is now the garden of Trumpeters' House, between Richmond Green and the River. In 1414 Henry V also founded a Carthusian monastery there known as Sheen Priory, adjacent on the N. to the royal residence. Henry VI continued the rebuilding in order that the palace might be worthy of the reception of his queen, Margaret of Anjou. Edward IV granted it to his queen for life. In 1492 a great tournament was held at the Palace by Henry VII. On 23 December 1497 a fire destroyed most of the wooden buildings. Henry rebuilt it and named the new palace "Richmond" Palace after his title of Earl of Richmond. The earldom was seated at Richmond Castle, Yorkshire, from which it took its name. 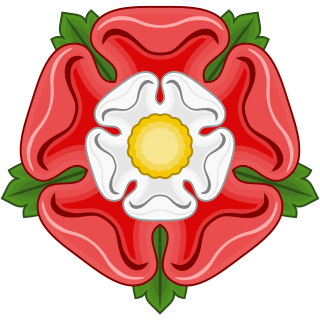 In 1502, the new palace witnessed the betrothal of Princess Margaret, daughter of Henry VII, to King James IV of Scotland. From this line eventually came the House of Stuart. In 1509 Henry VII died at Richmond Palace. However, at Christmastide 1497 a horrific fire broke out in the king's private chambers, destroying a large portion of the palace: the Milanese ambassador, Raimondo Soncino, witnessed the blaze, and estimated the damage at 60,000 ducats, in modern money about $10,138,450, or approximately £7 million. The fire lasted three hours and tore through the rest of the palace, causing panic and hundreds to flee. Hammerbeam roofs of the Middle Ages were a structural necessity as much as they were pretty architecture as they kept the heavy timbered roofs from caving in; they were the carpenter's equivalent of the stone vaulting found in Gothic cathedrals of the Middle Ages because as in famous examples, like Westminster Hall, they allowed the architect greater ability to achieve higher heights with thinner walls and evenly distributed the lateral weight. In as large a fire as described by Soncino the English oak beams of the great hall, a centrepiece of a royal Christmas, would have stood no chance of remaining upright and intact. They would have been engulfed in flames in the high temperatures well exceeding 270 °C. Much of the tapestry work of earlier ages was burnt to cinders, and losses included crown jewels and much of the royal wardrobe including a large amount of cloth of gold, at this time a luxury item only wearable by royalty and in the case of Sheen Palace it was a feature of the bedding. Construction on the new palace began in 1498. Henry named his creation Richmond Palace, in honour of the title he held before acceding to the throne and the title he inherited from his father: Earl of Richmond. Though the palace did not survive the English Civil War, fragments of the edifice still remain along the bank of the Thames, as does Richmond Park, originally a royal hunting reserve that Henry Tudor and all members of the Tudors and early Stuarts used for their personal entertainment. Henry Tudor built a large and grand palace that became the centre of royal life for many years to come, a very important centre of the court of each Tudor monarch and James I. Drawings and descriptions of the palace survive as does the documentation of a 1970s excavation of the grounds, thus posterity has a fairly accurate idea of what the contents and features of the building were. 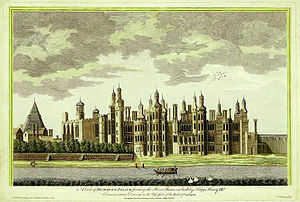 Richmond Palace was largely a building of brick and white stone in the latest styles of the times, with geometric octagonal towers, pepper-pot chimney caps, and ornate weathervanes made of brass. Though it retained the layout of Sheen Palace, new additions that would mark the Renaissance were to be found in this palace, for example, long galleries to display sculpture and portraiture. The windows were panelled, built to bring in more light than the tiny slit-like windows of a castle, built for defence. From its earliest it had inner courtyards designed for leisure, with several portions built for the royal family overlooking a large green. Richmond Palace covered ten acres of land and was large and well appointed enough to have its own orchards and walled gardens. It is known that Henry Tudor decorated his home with many gifts he accepted from Italian bankers in Venice, and the evidence for this and the other accoutrements survives in a 17th-century inventory taken of the palace that is now located in the British National Archives. The inventory also describes new tapestries he commissioned to replace the ones lost in the fire. On the night of the Epiphany (1510), a pageant was introduced into the hall at Richmond, representing a hill studded with gold and precious stones, and having on its summit a tree of gold, from which hung roses and pomegranates. From the declivity of the hill descended a lady richly attired, who, with the gentlemen, or, as they were then called, children of honour, danced a morris before the king. On another occasion, in the presence of the court, an artificial forest was drawn in by a lion and an antelope, the hides of which were richly embroidered with golden ornaments; the animals were harnessed with chains of gold, and on each sat a fair damsel in gay apparel. In the midst of the forest, which was thus introduced, appeared a gilded tower, at the end of which stood a youth, holding in his hands a garland of roses, as the prize of valour in a tournament which succeeded the pageant!" Henry's son, christened Henry, was born there on New Year's Day, 1511, but died on 22 February. Some years later, the king received a present of Hampton Court from Wolsey, and in return the cardinal received permission to reside at the royal manor of Richmond, where he kept up so much state as to increase the growing ill-feeling against him. When he fell into disfavour he took up his residence at the Lodge in the 'great' park, and subsequently moved to the Priory. In 1533 Richmond became the principal residence of Henry's daughter Mary after she was evicted from her previous residence of Beaulieu. Mary stayed at the palace until December of that year when she was ordered to Hatfield House to wait on the newly born Princess Elizabeth. In 1540 Henry gave the palace to his fourth wife, Anne of Cleves, as part of her divorce settlement. Reconstruction of Richmond Palace privy apartments. In 1554 Queen Mary I married Philip II of Spain. Forty-five years after her mother Catherine of Aragon had spent Christmas at Richmond Palace, they spent their honeymoon there (and at Hampton Court). Later that same year, her sister Elizabeth was taken to Richmond as a prisoner on her way to Woodstock. Once Elizabeth became queen she spent much of her time at Richmond, as she enjoyed hunting stags in the "Newe Parke of Richmonde" (now the Old Deer Park). Elizabeth died there on 24 March 1603. King James I preferred the Palace of Westminster to Richmond, but his eldest son Prince Henry was able to commission water-works for the garden designed by the French Huguenot, Salomon de Caus, and the Florentine Costantino de' Servi, shortly before his death in 1612. Before he became king, Charles I owned Richmond Palace and started to build his art collection whilst living there. Like Elizabeth, James enjoyed hunting stags, and in 1637 created a new area for this now known as Richmond Park, renaming Elizabeth's "Newe Parke" the "Old Deer Park". There continue to be red deer in Richmond Park today, possibly descendants of the original herd, free from hunting and relatively tame. An Elevation for a new Richmond Palace by Sir William Chambers in 1765. This plan was not taken up by the King. A new palace was started on a different design, but was not completed. The king gave the palace with the manor to Queen Henrietta Maria, probably in 1626, and it became the home of the royal children. Within months of the execution of Charles I in 1649, Richmond Palace was surveyed by order of Parliament to see what it could fetch in terms of raw materials, and was sold for £13,000. Over the next ten years it was largely demolished, the stones being re-used as building materials. The palace was restored with the manor to Queen Henrietta Maria in 1660, although in a dismantled condition, having suffered much dilapidation during the interregnum. The ruined palace was never rebuilt. All the accounts which have come down to us describe the furniture and decorations of Richmond Palace as superb, exhibiting in tapestries the deeds of kings and heroes. The survey taken in 1649 affords a minute description of the palace. The great hall was 100 feet in length, and 40 in breadth, having a screen at the lower end, over which was "fayr foot space in the higher end thereof, the pavement of square tile, well lighted and seated; at the north end having a turret, or clock-case, covered with lead, which is a special ornament to this building." The prince's lodgings are described as a "freestone building, three stories high, with fourteen turrets covered with lead," being "a very graceful ornament to the whole house, and perspicuous to the county round about." A round tower is mentioned, called the "Canted Tower," with a staircase of 124 steps. The chapel was 96 feet long and 40 broad, with cathedral-seats and pews. Adjoining the prince's garden was an open gallery, 200 feet long, over which was a close gallery of similar length. Here was also a royal library. Three pipes supplied the palace with water, one from the white conduit in the new park, another from the conduit in the town fields, and the third from a conduit near the alms-houses in Richmond. The extant structures of the former palace include the Wardrobe, Trumpeters' House and the Gate House, all three of which are Grade I listed. The Gate House was built in 1501, and was let on a 65-year lease by the Crown Estate Commissioners in 1986. It has five bedrooms. During 1997 the site was investigated in the Channel 4 programme Time Team which was broadcast in January 1998. This palace was one of the first buildings in history to be equipped with a flushing lavatory, invented by Elizabeth I's godson, Sir John Harington. Henry VIII had earlier installed flushing latrines at Hampton Court. ^ a b "Richmond", in Encyclopædia Britannica, (9th edition, 1881), s.v. ^ a b Historic England. "The Gate House The Old Palace (1065318)". National Heritage List for England. Retrieved 9 July 2015. ^ "Perpendicular Gothic architecture in England". ^ "English Historical Fiction Authors: A Not-So-Cool-Yule at Sheen Palace 1497". 7 December 2015. ^ Weir, Alison (2013). Elizabeth of York: A Tudor Queen and Her World (1st ed.). pg 215: Ballantine Books. ISBN 978-0345521378. ^ "English Historical Fiction Authors: The Lost Palace of Richmond". 5 July 2012. ^ Historic England. "The Wardrobe (1357730)". National Heritage List for England. Retrieved 9 July 2015. ^ Historic England. "The Trumpeters' House, Old Palace Yard (1357749)". National Heritage List for England. Retrieved 9 July 2015. ^ "History". Channel 4. Retrieved 12 March 2012. ^ Cloake, John (1995). Palaces and Parks of Richmond and Kew, Volume 1: The Palaces of Shene and Richmond. Chichester: Phillimore & Co. pp. 140–141. ISBN 978-0850339765. Wikimedia Commons has media related to Richmond Palace. Richmond is a suburban town in south-west London, 8.2 miles (13.2 km) west-southwest of Charing Cross. It is on a meander of the River Thames, with a large number of parks and open spaces, including Richmond Park, and many protected conservation areas, which include much of Richmond Hill. A specific Act of Parliament protects the scenic view of the River Thames from Richmond. Henry FitzRoy, 1st Duke of Richmond and Somerset, was the son of King Henry VIII of England and his mistress, Elizabeth Blount, and the only illegitimate offspring whom Henry VIII acknowledged. He was the younger half-brother of Queen Mary I, as well as the older half-brother of Queen Elizabeth I and King Edward VI. Through his mother he was the elder half-brother of the 4th Baroness Tailboys of Kyme and of the 2nd and 3rd Baron Tailboys of Kyme. 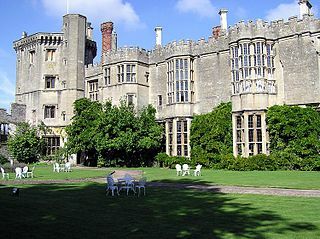 Thornbury Castle is a castle in Thornbury, South Gloucestershire, England. It was begun in 1511 as a home for Edward Stafford, 3rd Duke of Buckingham. It is not a true castle, but rather an early example of a Tudor country house, with minimal defensive attributes. It is now a grade I listed building. Oatlands Palace is a former Tudor and Stuart royal palace which took the place of the former manor of the village of Oatlands near Weybridge, Surrey. Little remains of the original building, so excavations of the palace took place in 1964 to rediscover its extent. Old Deer Park is an area of open space within Richmond, in the London Borough of Richmond upon Thames, England. It covers 147 hectares of which 90.4 hectares is not in public ownership, largely sports grounds for the sports of rugby and golf. Cecily of York, Viscountess Welles was an English princess and the third, but eventual second surviving, daughter of Edward IV, King of England and his queen consort Elizabeth Woodville, daughter of Richard Woodville, 1st Earl Rivers and Jacquetta of Luxembourg. She was First Lady of the Bedchamber to the queen in 1485-1487. Durham House, or Durham Inn, was the historic London town house of the Bishop of Durham in the Strand. Its gardens descended to the River Thames. Lichfield Court, in Richmond, London, consists of two Grade II listed purpose-built blocks of flats. Designed by Bertram Carter and built in fine Streamline Moderne style, it was completed in 1935. 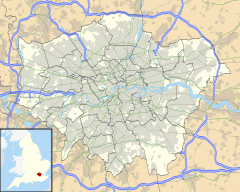 The London Borough of Richmond upon Thames was created in 1965 when, under the London Government Act 1963, the Municipal Borough of Richmond (Surrey), the Municipal Borough of Barnes and the Municipal Borough of Twickenham were merged to become a new London borough within Greater London. Sheen Priory in Sheen, now Richmond, London, was a Carthusian monastery founded in 1414 within the royal manor of Sheen, on the south bank of the Thames, upstream and approximately 9 miles southwest of the Palace of Westminster. It was built on a site approximately half a mile to the north of Sheen Palace, which itself also occupied a riverside site, that today lies between Richmond Green and the River Thames.